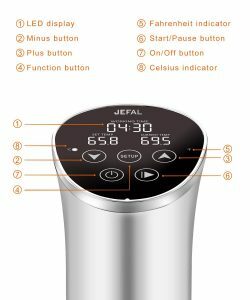 JEFAL Sous Vide Circulator is a modern immersion cooker with a 1000-watt power, a stainless steel body and a digital LED display panel. It is rated an impressive 5 out of 5 stars by 10 customers at the time of this product page release. The price tag seems normal for an immersion circulator with user-friendly, modern features and a strong build quality. The Jefal Sous Vide is easy to operate overall without any complicated technology to deal with, as there is no Bluetooth or WiFi feature. But make no mistake, this one has the more advanced technology than the previous models. It is a plug and play type of unit that works intuitively and that can be used straight out of the box. There is a strong-grip clip on the side that lets you fit it on pretty much any pot easily. You add some water in the pot, place your ingredients inside the sealed bag or even a glass jar. And press the On/Off touch button, set the time and temperature to the doneness level of your choice to begin cooking immediately. You can control the procedure easily with the timer and temperature settings. The ingredients will be cooked in a shorter amount of time and hands-free. You let it do the job and there is no need to watch the cooking process. You can just relax or go and do your own thing in the house. Restaurant quality results will be achieved every single time that you simply can not with the traditional cooking methods. Whatever you cook will be tender and moist with all the flavors and juices staying in, and without any unwanted rare centers or dry edges- no over or under cooking. You will get these great results consistently thanks to the constant temp control. It can be used for steak, red and white meat, fruits, veggies, desserts and more. You may use it comfortably whether you’re totally new to sous vide cooking style or an expert in it. It is very easy to clean and maintain as the removable stainless steel skirt and disks are safe to be put in the dishwasher. It weighs 3.4 pounds and measures 14.6 x 3.7 x 14.6 inches- is lightweight and portable and you can store it in a drawer. It runs very quietly and the water pressure is reduced significantly with the twisting water pump. If you want a golden and crispy exterior on your steak or other ingredients you’ll want to sear on the pan, broil or grill after taking it out of the water. You can use the Jefal Sous Vide in a Rubbermaid container with a sous vide lid on, with a hole in the corner. You can’t start the timer at a set time and it counts down as cooks your ingredients. The water tank capacity shouldn’t be more than 15-19 liters (4 to 5 gallons) for the sous vide to operate efficiently. You can use the sous vide bags without worrying whether plastic is bad for health as these bags are food-grade and created for that purpose. And with the sous vide method the food is cooked at lower temperatures. You’ll get good results with your steaks consistently, even with the thick medium rare steaks. If you’re not ready to eat you can leave the food in the container as it can stay in another two hours after the cooking is completed and your steak will not be cooked more or become well done. You can also cook your meat or veggies from frozen to the perfect doneness. 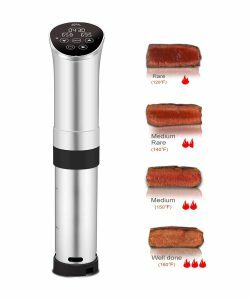 There is a lot you can do with this compact immersion circulator and all will turn out with awesome high quality results, with the meat or other ingredients tasting much better. The Jefal Sous Vide is offered with a money back guarantee and they will refund or replace your order if not happy for whatever reason. Customer support team will be happy to help out, answering any questions you may have. You’ll also get the Amazon technical support included in the box free of charge. We certainly do not hesitate to recommend it.